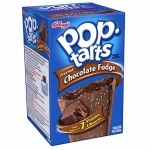 Kellogg'sPop-Tarts Frosted Chocolate Chip toaster pastries 8 Count 14.70 oz 416g Chocolate chips baked into a cookie crust that's drizzled with chocolatey icing and filled with chocolate flavored goodness. Grab a tall glass of milk and dunk away. Pop Tarts In the U.K.
Enriched Flour (Wheat Flour, Niacin, Reduced Iron, Thiamin Mononitrate (Vitamin B1), Riboflavin (Vitamin B2), Folic Acid), Sugar, Vegetable Oil (Soybean, Palm, Cottonseed And/Or Hydrogenated Cottonseed Oil* With Tbhq And Citric Acid For Freshness), Dextrose, High Fructose Corn Syrup, Cracker Meal, Corn Syrup, Whey, Two Percent Or Less Of Semisweet Chocolate Chips (Sugar, Chocolate, Cocoa Butter, Dextrose Soy Lecithin), Milk Chocolate (Sugar, Chocolate, Cocoa Butter, Milk), Cocoa Processed With Alkali), Molasses, Salt, Natural And Artificial Flavors, Wheat Starch, Leavening (Baking Soda, Sodium Aluminum Phosphate), Nonfat Dry Milk, Caramel Color, Egg Whites, Cornstarch, Soy Lecithin, Gelatin, Mono- And Diglycerides, Xanthan Gum, Sodium Stearoyl Lactylate, Yellow #6 Lake, Datem, Blue #2 Lake, Red #40 Lake, Vitamin A Palmitate, Yellow #5 Lake, Niacinamide, Reduced Iron, Pyridoxine Hydrochloride (Vitamin B6), Riboflavin (Vitamin B2), Thiamin Hydrochloride (Vitamin B1), Folic Acid. *Less Than 0.5G Trans Fat Per Serving. I buy different flavours for the grandchildren and every flavour to them is the best! So everyone’s a winner.